Virginia gubernatorial candidates Lt. Gov. Ralph Northam and former U.S. Rep. Tom Perriello after a Democratic primary debate in Richmond in May. The off-year-elections beat marches on today with gubernatorial primaries in Virginia. Two Democrats that previously had moderate records, Lt. Gov. Ralph Northam and former Rep. Tom Perriello, are fighting over who is the most anti-Trump. Neither has held a consistent lead in the publicly released polls. Meanwhile, on the Republican side, former Republican National Committee Chairman Ed Gillespie is favored. But he is struggling to find a comfortable position on President Trump, and he’s trying to hold off former Trump statewide Chairman Corey Stewart. The polls on the Democratic side of the aisle have been all over the place. Seven polls have been conducted and publicly released since early May. Five have had Perriello ahead, and two have had Northam up. On average, the race is basically tied; Northam is up 40 percent to 39 percent. But the polls show a wide range of possible outcomes — anything from a Northam blowout to a high-single digit lead for Perriello. Meanwhile, these aren’t the highest-quality polls in the world. The survey showing Northam winning in a blowout was done on behalf of Northam’s own campaign. 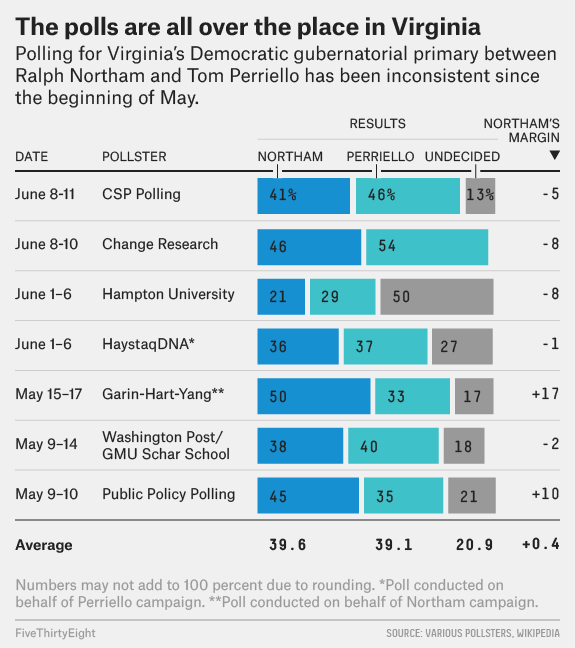 The results giving Perriello his largest leads come from one pollster with basically no track record (Change Research) and one that allowed likely primary voters to select a candidate in both the Democratic and Republican primary (Hampton University).1 Perriello’s own polling only has him up by a point, and released internal polls are usually more favorable for the candidate who sponsored the survey. With the average poll showing more than 20 percent of the electorate undecided, a large victory by either Northam or Perriello is plausible. The biggest question is who shows up to vote. Northam is rooting for an older electorate. He was up by 16 percentage points among voters age 65 or older in the most recent Washington Post survey. Perriello, on the other hand, wants more young voters to turn out than normal. The same Washington Post poll gave him an advantage of 20 points among voters younger than 40. The Change Research survey has an even wider gap between younger and older voters. This age gap is reminiscent of last year’s Democratic primary between Hillary Clinton and Bernie Sanders, which some have argued this primary is replaying. Clinton, as you may remember, did very well among older voters, while Sanders did even better among young voters. But as my colleague Clare Malone pointed out earlier this year, “Tom Perriello Is Not Bernie Sanders.” I’ll go a step further: This primary has pretty much nothing to do with Clinton vs. Sanders. Perriello and Northam have historically both had moderate records. This year both have run strongly against the Republicans in Washington, D.C. Moreover, the main dividing line between Northam and Perriello isn’t really left vs. right. The polls generally show that very liberal and moderate Democrats are voting similarly. The Change Research poll had Clinton backers making up the vast majority of both Northam and Perriello supporters. That’s consistent with Clinton’s large win in the primary last year. If the Virginia primary is splitting the Democratic Party, it’s along a state vs. national fault line.2 Northam has the backing of most local politicians, including Gov. Terry McAuliffe and Sen. Tim Kaine. Perriello has endorsements from bigwigs in the national Democratic Party such as former Clinton campaign Chairman John Podesta and Sanders. The bottom line is that the outcome in today’s Democratic primary will likely tell more about local Virginia politics than anything about the Trump administration or the nation as a whole. Most analysts believe that Gillespie, who was the Republican nominee for Senate in 2014, will make it to another general election. The polling has been limited, but Gillespie has led in every poll but one by 15 percentage points or more. However, Change Research’s poll actually has Stewart ahead 42 percent to Gillespie’s 41 percent. The poll is an outlier, but in a low-turnout open primary (where some nominal Gillespie supporters may decide to cast a vote in the Democratic primary) Stewart may benefit from an enthusiasm edge. Remember, this is the state where Eric Cantor shockingly lost his primary in 2014, even as the polls had him ahead. Even if Gillespie doesn’t suffer Cantor’s fate, he’ll still be facing an uphill battle in the general election. The two most recent polls have both Northam and Perriello ahead by double-digits over Gillespie. McAullife’s approval rating is well above his disapproval rating, while Trump’s approval rating is below 40 percent in the state. Gillespie, if he wins today, could run a strong campaign in the fall and plausibly win, but the fundamentals will be against him. Voters, of course, can only vote in one primary. Very similar to the 2006 Virginia Democratic senatorial primary.